The Valentine Phantom has been striking downtown Portland for at least 30 years. The Portland Museum of Art is a frequent target. PORTLAND, Maine — Every Valentine’s Day, for more than 30 years, something mysterious happens in downtown Portland. Magically, the city is plastered in red paper hearts overnight. From tiny shops to major landmarks to cozy corners here and there, the so-called Valentine Phantom, often referred to as the Valentine Bandit, strikes without notice, sending the city a giant love letter. Now in its 30th year, the phantom is as elusive today as he — she? they? — was the first year. Like all urban legends, Cupid’s identity has never been revealed. 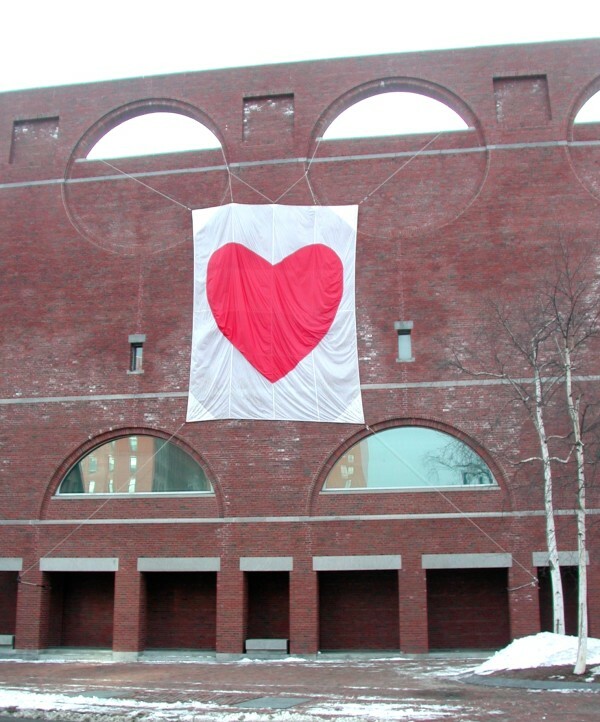 Walking through the Old Port, down Congress Street and sometimes driving over the Casco Bay Bridge, a sea of hearts appear every Feb. 14. From giant banners on the Portland Museum of Art to smaller versions on cafes and even affixed to the floating DiMillo’s on the Water, the red hearts seemingly are everywhere. According to Portland’s Downtown District, the love phantom first struck in 1985. “I was just thinking the other day that this will be the 30th anniversary,” PPD executive director Steve Hewins said. Those with institutional knowledge agree this is a big anniversary. But according to the Valentine Phantom’s Wikipedia page, the fun started in 1976. At the Portland Museum of Art, public relations director Kristen Levesque admits the museum gives the bandit a boost every year to help display the symbol of love in Congress Square. With snow in the forecast, could this be the year the bandit calls it quits? “I don’t think so. This bandit is pretty hardy,” Levesque said. No matter who is responsible for the deed, whether a few people or a silent army, one thing is clear: No one wants to unshroud the mystery. And in this snowy, cold winter, the phantom is a needed talisman for winter-fatigued urbanites — sort of an anti-Punxsutawney Phil. “It is a reminder that we are all in it together,” said Jennifer Hutchins, executive director of Creative Portland, who has lived in Portland for 20 years. She looks forward to the “simple gesture done in a grand way” every February. “The act of printing out red hearts and pasting them on doors seems to do a miracle job of hitting at the heart of what the Portland community is all about,” she said. She suspects Maine College of Art, across the street, is the culprit. An inquiry to their marketing department this week went unanswered. There have been copycat Valentine Phantoms that have hit parts of New Hampshire, but Portland’s bandit is a true original. In fact, Hutchins credits the mysterious sprite as a forerunner in the spur-of-the-moment, feel-good happenings — from yarn bombs to symphonies breaking out in subways — sweeping the globe. Despite the message it sends, not everyone is pleased by this unsolicited, kind caper. This year, though, the hearts will remain on the floating Old Port institution. “I am working a double shift on Saturday. I’ll make sure they are not taken down,” he said.